What is atemi? I hear you ask. Atemi strikes are aimed at key areas of the body: nerve endings, arteries running close to bone, organs, sensitive and vulnerable joints like elbows and knees. 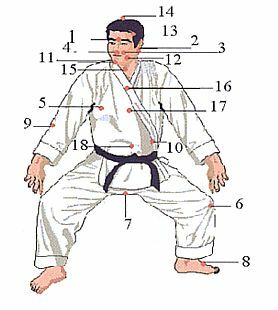 These strikes can be made with virtually any part of the body, open hand, fist, fingers, elbow, toes, heel, knee, even your head - all are viable tools for attacking an aggressor's key atemi points. Atemi was developed in Asia thousands of years ago. In China it became known as dim mak, (death touch) while the Japanese, called it Atemi; a system of strikes and painful joint holds aimed at one of the central nervous system's 365 "pressure points." Paradoxically many of these points are also used in the healing art of acupuncture, which began its development at about the same time. For many years it remained exclusively in China but as Chinese and Japanese cultures intermingled, the art migrated to Japan. The early masters spent many hours researching human anatomy in their quest for atemi perfection. They toiled over anatomical charts and experimented on prisoners of war and criminals. They immersed themselves totally in this learning, committing to memory their secret knowledge, refining it as they progressed and keeping the secrets of Atemi within the confines of their immediate families or clans. During the 15th century, the samurai warriors began to assimilate Atemi strikes into their systems of battlefield unarmed combat - the martial arts. Atemi strikes gave them several advantages: Atemi strikes require no flamboyant stances, no flashy movement, they are direct and decisive. The samurai could employ a fatal blow quickly to end a life threatening confrontation or a use a quick disabling strike that would render the opponent helpless but alive for interrogation. - minimum power, little effort and maximum effect. Various modern jujitsu, karate and ninjitsu systems employ atemi strikes however, very few people have a complete understanding of the original art. The true masters were very selective about the students with whom they shared this knowledge. Today's Atemi masters number in tens rather than hundreds. It's said that in their prime, the old masters could administer an atemi strike without touching the body, a channelling of focused chi at one of the victim's vulnerable pressure points was enough. In some instances once struck, the victim felt nothing and then fell down dead several days later. Such is the stuff of legend...or is it? There are a limited number of pressure point Atemi specialists who claim to possess this skill, and many others who have witnessed their 'untouched' knockouts. It may be truth, myth or an assault on our imaginations. One thing is certain though, in the hands of a skilful practitioner, Atemi strikes can paralyse, maim or kill.